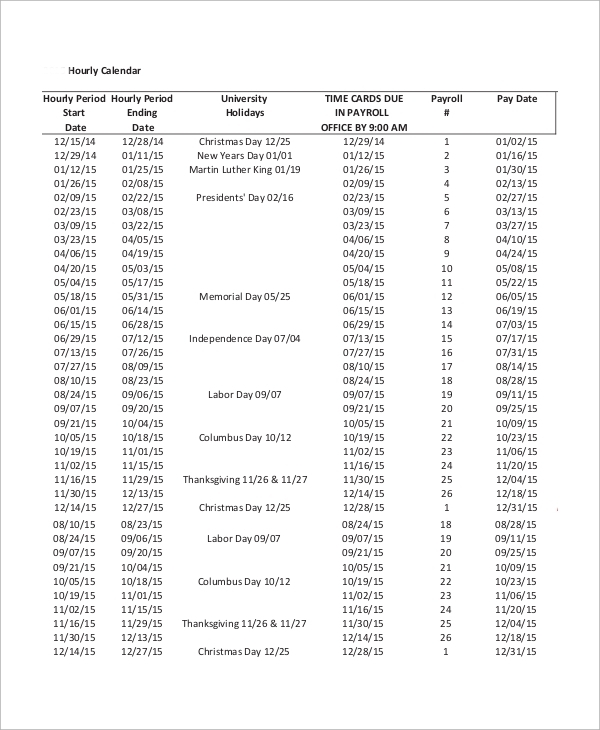 Hourly calendar templates are useful for official work. Both the companies and the employees need to have them for various official purposes. The following Sample Calendars have different formats such as fortnightly hour calendar, monthly, weekly and general hourly timesheets. They are used to write down the working hours for a given day for part-timers, to notify employees of different hourly events as well as to make an employee understand his/her work input month wise or year wise. This is a fortnightly hourly calendar which is useful for companies where payment is paid on a fortnight basis. 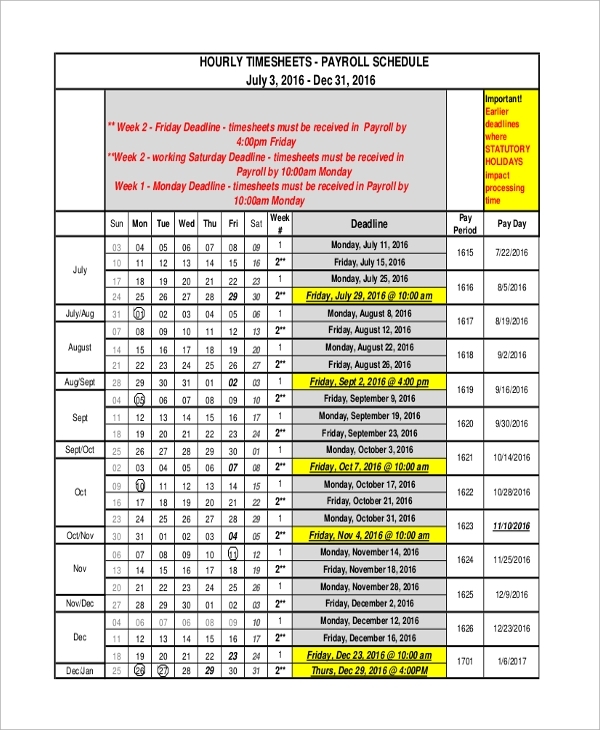 It comes in a tabular form describing the pay period, start and end date, payroll processing and pay date and the corresponding month so that the employees know it in advance. 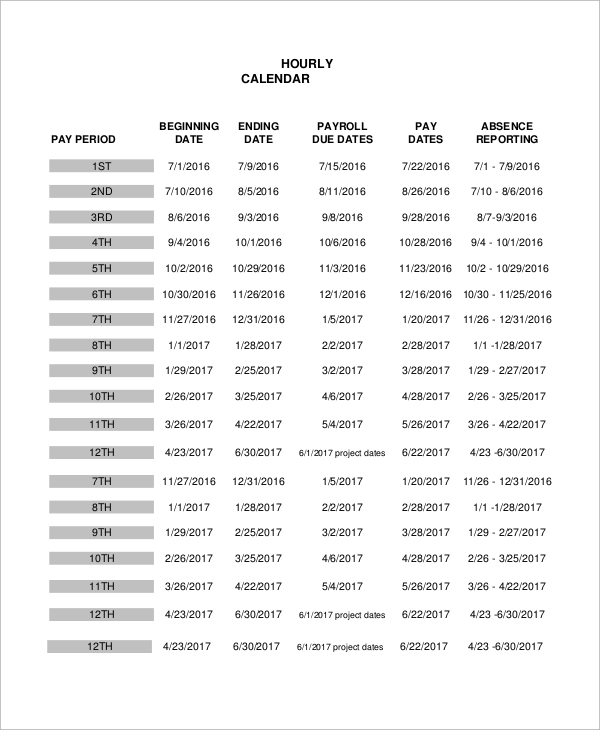 Hourly Payroll Calendar is maintained by companies where payroll is processing for an irregular period depending on the work availability. It is mostly for temporary or part-time employees. It states the payroll period, due dates for pay and absence reporting. 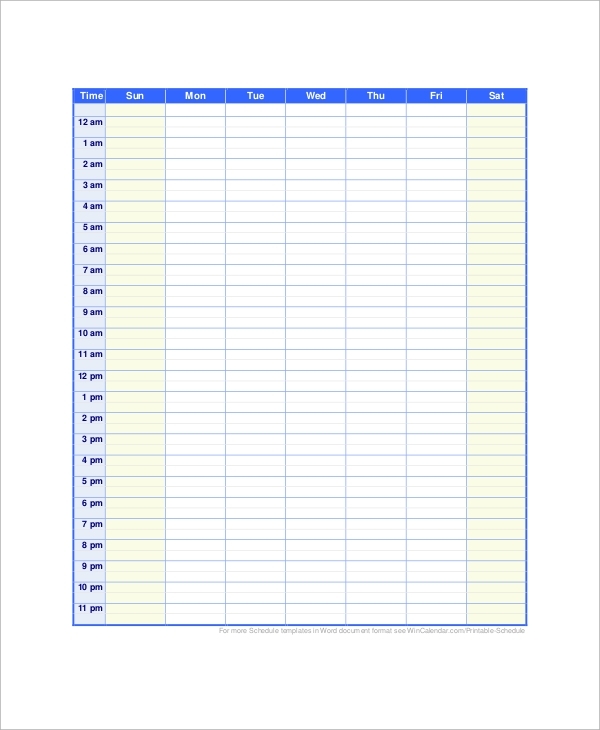 Hourly Timesheet calendar is useful for every organization to list the timing of different events such as deadlines, meeting, celebration and other official works. It is also useful to notify the working hours which may vary for specific employees based on projects. 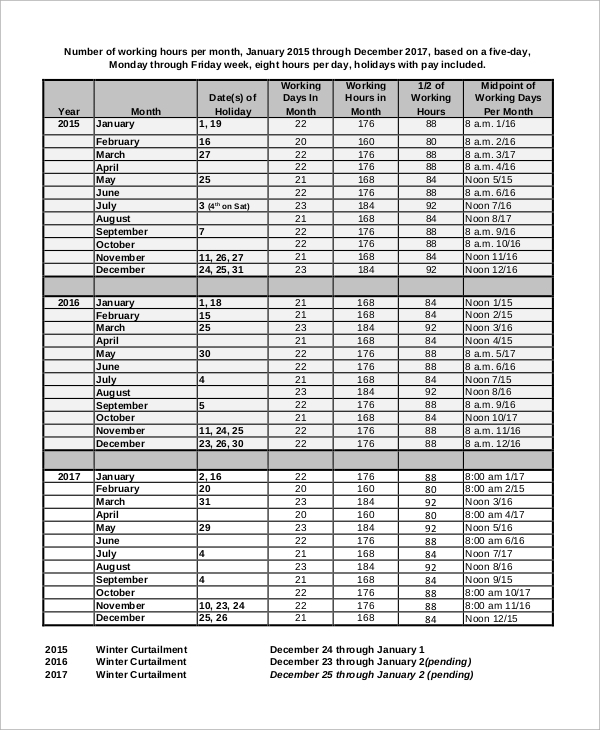 The Sample Calendars Printable and they are available in an hourly format for daily usage, weekly and even monthly usage. Employees need them to list their working hours and submit it to hiring authorities after approval of team leader to get paid in due time. 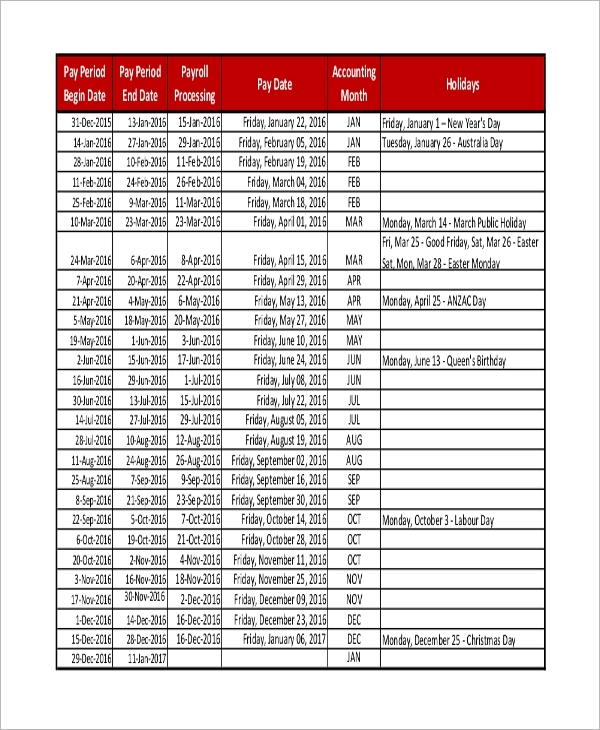 Companies keep track of employees’ work inputs and send them to report with such calendars for better understanding. They are useful for companies where payment is given on an hourly basis, or there are lots of part-time employees. 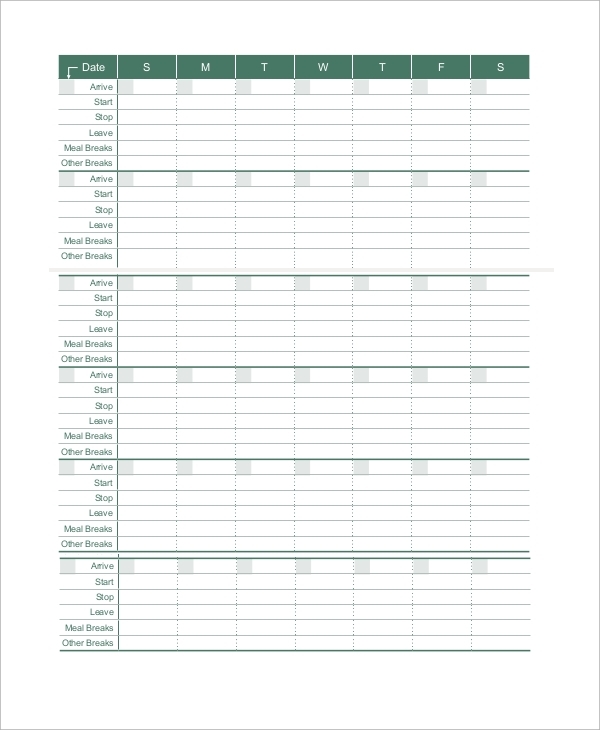 This is a Printable Weekly Calendar Sample with a tabular format. It is a weekly calendar and the hours of every day represent the rows. It is important for companies where works are divided hourly and for employees to write their progress every hour. It is also important for the part-time employees to note the attending hours and work done. This is a Sample Monthly Report of the working hours of an employee for one year or multiple years. It states the month, dates of holidays, total working days and hours in the month. It is useful for a company where employees work on an hourly basis and get paid accordingly. It is also a report of an employee to understand with progress and deficiencies. The targeted audiences of the hourly calendars are any working organizations and its employees. Companies need them to list special events beforehand and send them to the employee to keep them reminded. It is also used to list the working hours of an employee and send it to him to see his work input. In companies where payment is made on the hourly basis and there are lots of part-time employees, such calendars are useful to maintain the working hours and get paid accordingly. 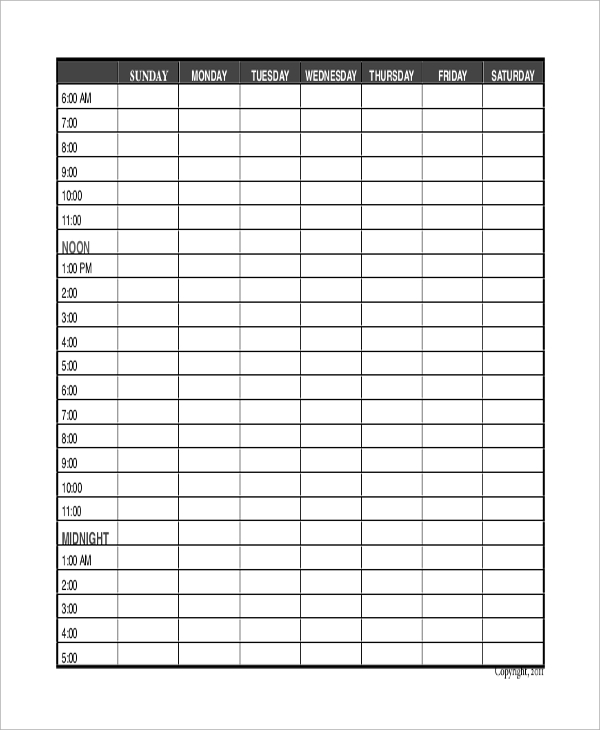 The above-listed Sample Daily Calendars where there is a clear division of hours in tabular form are helpful to write down the milestones achieved during working hours. They are useful to notify the employees of deadlines, meetings or any special events in a working organization. It is particularly important to list the working hours on a daily basis and submit it in due time to get the pay in due time.